It’s coming … Small Business Saturday. That one glorious day of the year where small businesses around the country have their day in the spotlight. Small Business Saturday is always sandwiched in between the two other biggest shopping days of the year: Black Friday and Cyber Monday. The holiday, which falls on November 29 this year, was founded in 2010 by American Express as a day to celebrate local businesses and all they do to make their neighborhoods so great. Last year, shoppers spent $5.7 billion with independent merchants on Small Business Saturday, according to research from American Express and the National Federation of Independent Business. It’s not just small businesses that have embraced the day. Forty-one governors issued proclamations supporting the campaign, and more than 3.3 million Facebook users have liked the Small Business Saturday page. Retail sales in November and December could hit nearly $617 billion this year, according to projections from the National Retail Federation. This would be a 4.1% increase over 2013, which only saw a 3.1% increase over the same season in 2012. Thousands of small businesses around the country are hoping to boost these numbers, and Small Business Saturday is their chance to ramp things up for the holiday season. The shop-small movement has really picked up steam since 2010 – almost half (44%) of consumers were aware of the holiday last year – but there are things you can do on a local level to get your customers excited. Share interesting factoids and research about the impact of small business in your social media channels and on your website and blog. The Small Business Saturday website is chockfull of information. You could also send an e-mail blast to your database of customers, letting them know about the holiday and inviting them to your store. 2. Don’t compete on cost. You likely can’t afford to drop your prices as low as the big-box retailers in your neck of the woods, so don’t. Instead, compete on something other than price – think atmosphere or experience. If you own a pizza joint, you could host a dough-flipping contest. Coffee shops could have sipping stations with different flavors of coffee or hot cocoa. Bookstores could aim to draw in families by holding a story time with costumed characters. You don’t have to offer deep discounts to win over new customers – you just have to do something memorable and unique. Small Business Saturday is an excellent time to co-market because you’re already part of a group of like-minded businesses. How do you choose a co-marketing partner? Look for a business that naturally overlaps with yours. If you own a flower shop, for example, it makes sense to partner with a local wedding business. You could collaborate on everything from social media to promotional products. You get your brand in front of new audiences and save money at the same time. Check out this article for a great example of a co-branding partnership. 4. Make it a celebration. Small Business Saturday is a big deal. It’s a nationally recognized day with a whole country of supporters rallying around it. Dive into the day and make it fun for shoppers. Create an in-store countdown calendar leading up to November 29. When the celebrated day arrives, kick it off with some exciting incentives. Make people want to shop at your business. Think about decorating your store with balloons, signage, and banners. Hand out products imprinted with your logo. Get on social media and use the official hashtag, #smallbizsat, to share special offers. The idea is to let the community know you’re proud to participate in Small Business Saturday. When customers take the time to choose your business over a mega retailer, show them how much you appreciate them. It doesn’t take much to say thanks. You could post a message on Facebook thanking shoppers for their patronage. Or you could hand out small promotional products – think seeded paper bookmarks for bookstores or individually wrapped cookies for bistros – as a token of appreciation. Personal, thoughtful gestures like these will help set your business apart from mass retailers. Customers will remember that you took a moment to show appreciation, and they’ll return the favor by vising your business again. Small businesses: This is your day. Make the most of it. It can be a challenge attracting customers to your shop – especially in the wake of Black Friday. But by approaching the day with a plan and plenty of enthusiasm, Small Business Saturday can be an amazing kickoff to your best holiday season yet. 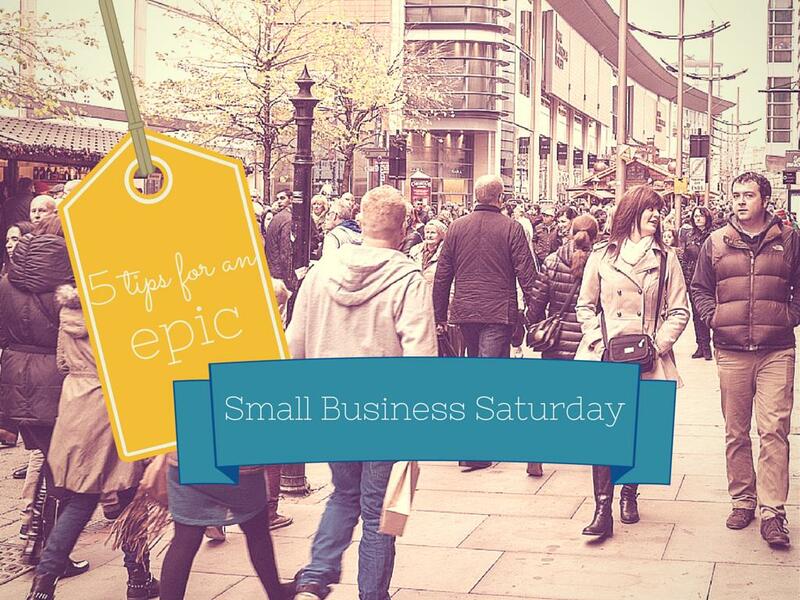 What is your business doing for Small Business Saturday? Share with us in the comments!